There is a dramatic effigy in a niche in the Cathedral of St.James in Santiago de Compostela. It depicts St.James in medieval military garb astride a horse, brandishing a sword above his head. Legend has it that St.James – Santiago – appeared to Christian troops during the semi-legendary Battle of Clavijo in 844 in which Spanish Christians defeated a much bigger Muslim army. During the following seven centuries of conflict between Christians and Muslims in the Iberian peninsula – from roughly 800 until 1492 – Santiago was adopted as the divine mentor of the Christian forces. He was given the name Matamoros, “Killer of Moors” i.e. killer of Muslims, and subsequently became the patron saint of Spain. “Santiago y cierra, España!” (St. James and attack, for Spain!) became the battle cry of Spanish armies as they slowly recovered the Iberian peninsula from its Moorish rulers. The cry persisted into modern times and was frequently used as a nationalistic slogan during Franco’s long years of Fascist rule. Santiago Matamoros as I photographed him in Santiago de Compostela Cathedral, late July 2011. 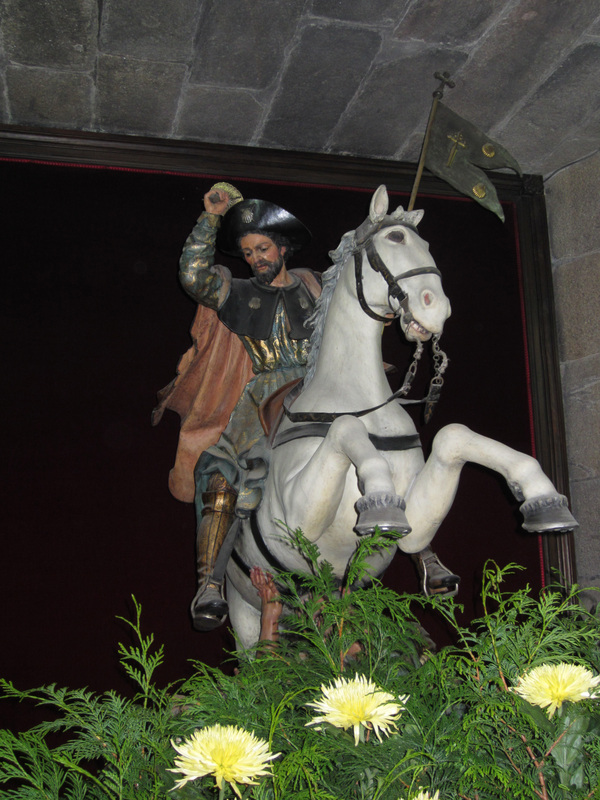 In the cathedral of Santiago de Compostela, the saint’s horse rears from behind an arrangement of fresh leaves and flowers. 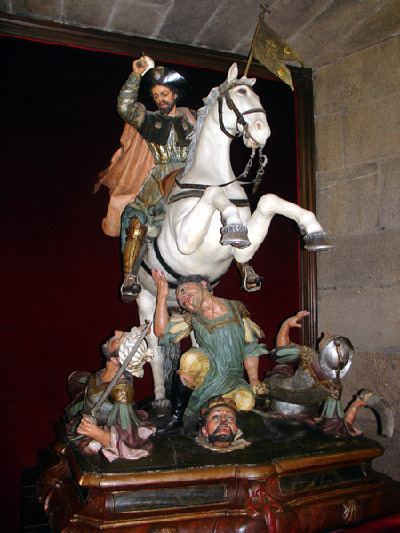 As even the quickest search of the internet will confirm, behind this fragrant corsage Santiago’s horse is actually trampling over Moorish soldiers and his sword is meting out death. There is even a severed Muslim head on the ground below him. It is, I suppose, to the credit of the cathedral that it seems to be squeamish about the image. Perhaps the mangled limbs are camouflaged out of politically correct consideration for the feelings of Muslims. Perhaps (and I hope this is the case) the church has awakened to the realisation that nothing could be more contrary to the teachings of Jesus Christ than this sympathetic, even admiring, representation of brutal murder. Whatever the case, the full barbarity of the image is something the Church no longer wants visitors to see. Someone on the cathedral’s staff regularly replaces the leaves and flowers, no doubt standing back each time to check that the true character of the image remains well hidden. It is the purpose of a pilgrimage not just to present you with a challenge and deliver you to a destination but to set you thinking about life, faith and the practice of religion. In this spirit, the image of Santiago Matamoros triggered my curiosity about the intrusion of martial imagery into churches. Naively I wondered how widespread this was. So while walking through England I visited several cathedrals and churches. Without being systematic or obsessive about it, I kept an eye out for images of war and murder inscribed – as it were – inside these churches. I didn’t have to look very hard or very far. Every time I entered a church the images were immediately in my face. I found that – without exception – every one of the temples of Christian peace that I visited displayed eulogistic representations and commemorations of warriors and war. The churches, irrespective of denomination, seemed to be showcases for state-supported military mayhem. 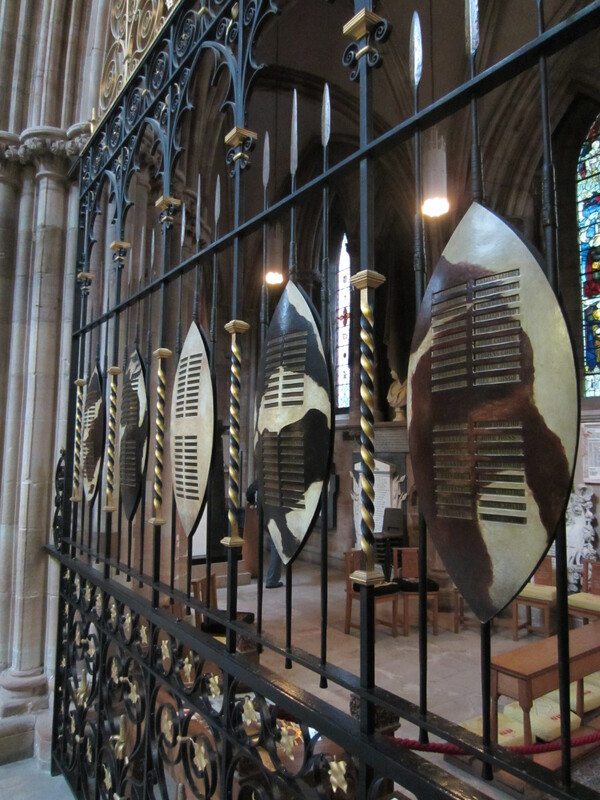 Zulu spears and shields: stylised war trophies in Lichfield Cathedral. It would be a consolation if I could report that the images I saw only commemorated those who died resisting aggression by the enemies of freedom and peace. But I was struck by the many images – probably a majority – that commemorate Britain’s wars of aggression in distant lands. One of the most shocking is to be seen in Lichfield Cathedral. In one corner of the cathedral there is a prominent memorial to those who died during Britain’s wars of conquest against the Zulu people of South Africa (1878-1879). The memorial takes the form of a palisade of Zulu spears and shields – stylised war trophies, in effect. 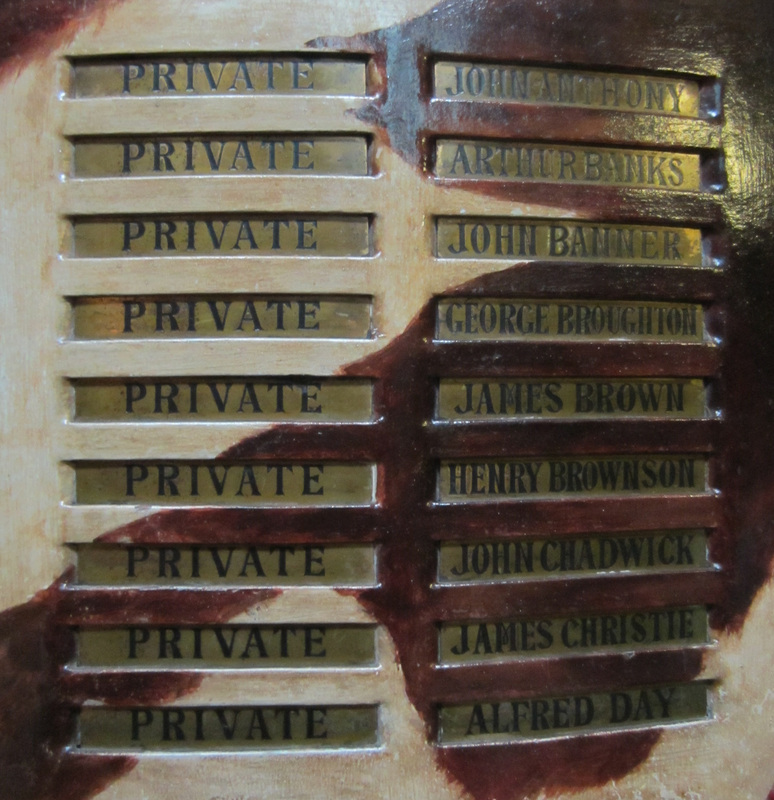 The names of the soldiers who died are inscribed on the shields. The names of British war dead triumphantly inscribed on Zulu shields in Lichfield Cathedral. 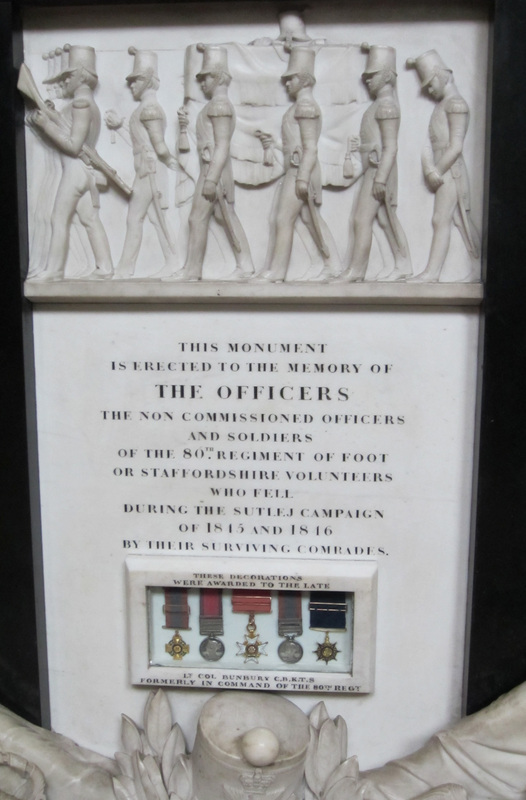 Also in Lichfield Cathedral there is a memorial to members of the local Staffordshire Regiment who died during the first Anglo-Sikh War (1845-1846) in India, also known as the Sutlej Campaign. The brutal Sutlej Campaign was the very first for which medals were issued with metal bars or clasps that could be attached to a medal’s ribbon. In a bizarre touch, some of this purely military memorabilia is displayed in the “holy” precincts of the cathedral. Medals from the Sutlej Campaign on display in Lichfield Cathedral. Beyond the unfeeling crassness of such memorials there are many more subtle and more powerful tributes to war. 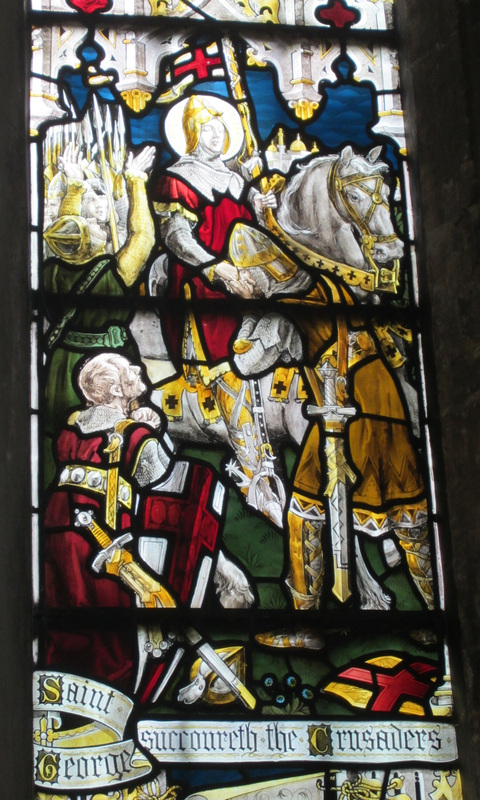 For example, in Holy Trinity Church, Stratford-upon-Avon (where William Shakespeare is buried), there is a stained glass window depicting England’s national saint, St. George, providing succor to the Crusaders. 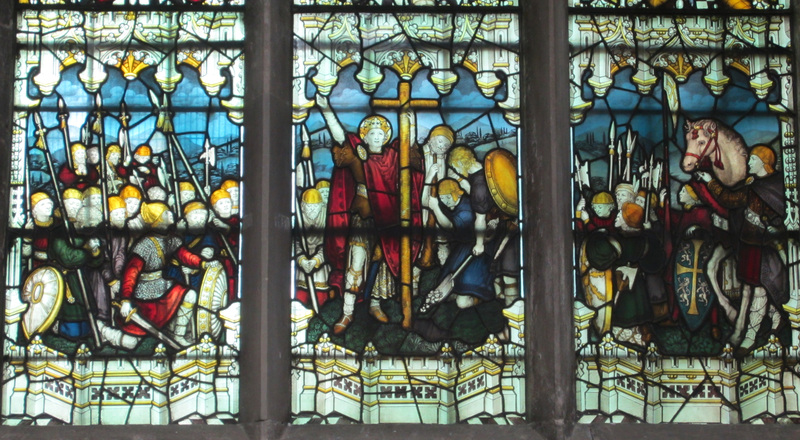 There is also a stained glass image of medieval combat with soldiers clustered around a big crucifix. 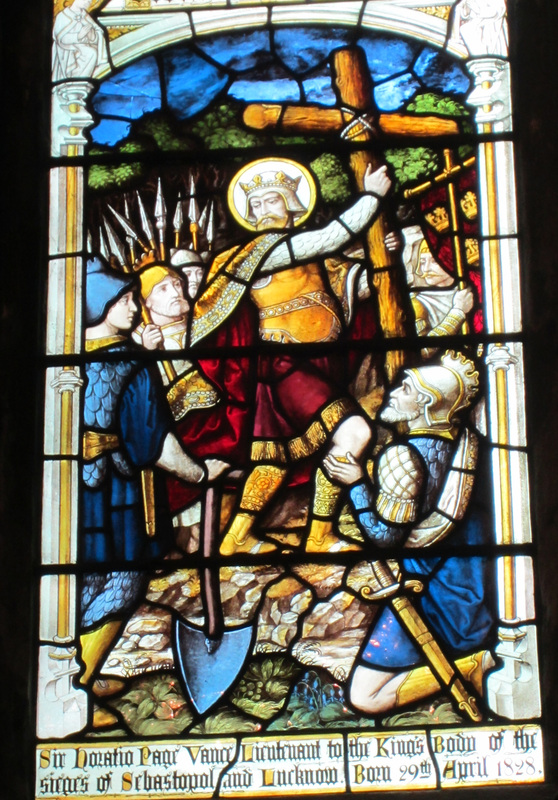 St.George, patron saint of England, urges on the Crusaders (Holy Trinity Church, Stratford-upon-Avon). St.Oswald in full battle dress with the halo of Christian piety (Carlisle Cathedral). In Carlisle Cathedral, St.Oswald appears in full battle armour carrying an enormous sword with a halo of Christian piety crowning his head. 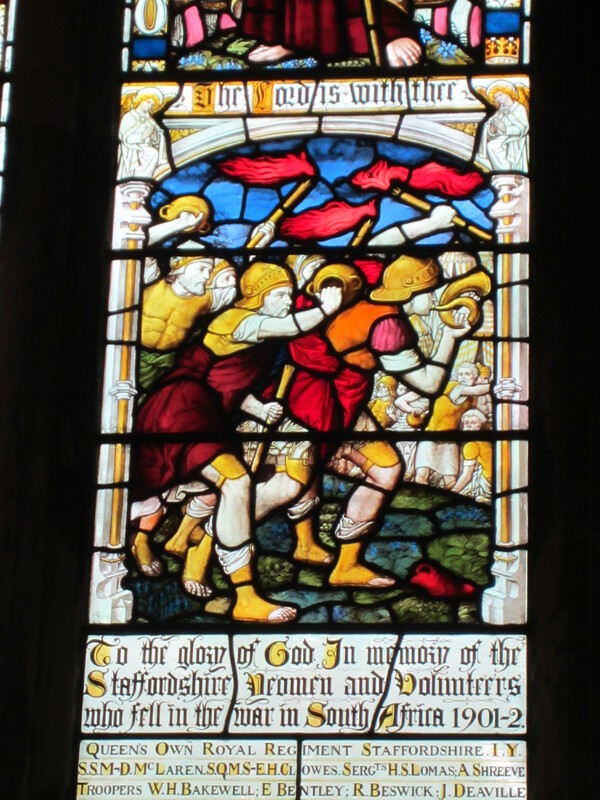 In Lichfield Cathedral a colourful stained glass window is dedicated to the memory of a certain Sir Horiatio Page Vance who fought at the sieges of Sevastopol in the Crimea (1854-1855) and Lucknow in India (1857). It depicts British sappers, complete with a large shovel, undertaking a siege some time in the Middle Ages. In St.Mary’s Church, Painswick, a model sailing boat is attached to the wall. 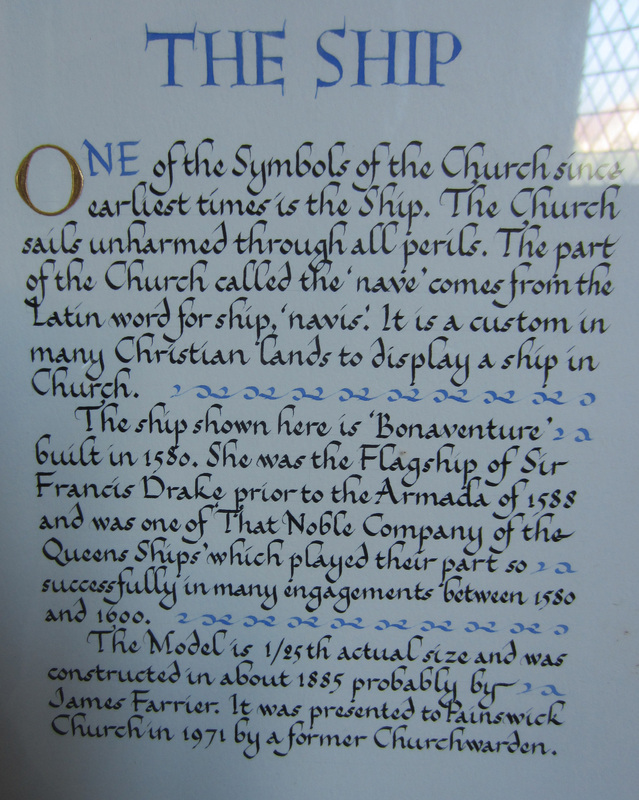 Beside it a plaque likens the Christian Church to a boat, then draws a parallel between the boat of Christianity and a battleship of sixteenth century England that saw action against the Spanish Armada. It is possible to see these images as mere curiosities, toothless survivals from a cruel past preserved like exotic museum-pieces in the more enlightened times we now live in. But in the churches I visited, none of the images are presented as violations of Christian values. On the contrary, they seem tailor-made to normalise the uncritical depiction of violence within the precincts of the church. All of the images I saw – and no doubt countless more I have not seen – make a subtle but very powerful point: there is a hand-in-gauntlet alliance between the Christian church and the practice of war, and this alliance continues into the present. The Ten Commandments and the Sermon on the Mount lie at the heart of Christian doctrine, and neither could be more forthright: Thou shalt not kill and Love your enemies… whosoever strikes you on the right cheek, turn to him your other cheek as well. These are tough admonitions so it is not surprising that in everyday life and politics they are pretty comprehensively ignored. And theologians too, from St.Augustine to the padres of modern armies, have tried to water them down. But (to me at least) it is surprising that they also seem to be almost totally ignored, even trampled on, certainly compromised, in the iconography and worship of Christian churches where, of all places, they should be prominently and uncompromisingly affirmed. In short, on the evidence of what I saw in Santiago de Compostela and in England, many Christian churches are little short of arsenals stuffed with iconographic weapons and iconographic flak jackets for use by the propagators of war and their apologists. This entry was posted in Camino de Santiago, Reflections on walking by George Quinn. Bookmark the permalink. Quite right! To quote a (by now) old friend of mine: Que le coeur de l’homme est creux et plein d’ordure ! (Blaise Pascal, Pensées, 143.) He puts it very well, don’t you think? Quite right! As a (by now) old friend of mine said: Que le coeur de l’homme est creux et plein d’ordure ! (Blaise Pascal, Pensées, 143.) He puts it quite well, don’t you think? Pienso que en cada etapa de su existencia, en cada región del planeta, el ser humano ha creado un dios a su imagen y semejanza. O mejor dicho: de acuerdo a sus necesidades. La Iglesia de Roma no ha sido una excepción, muy al contrario, pero como todas la demás iglesias y creencias. Sin embargo, gracias a esas orientaciones, o adaptaciones, de las creencias de nuestra fe, nuestra cultura resistió primero y prevaleció después. Quizás por desistir de ello ahora, intentando “universalizarse”, termine extinguiéndose.